Preventative maintenance in today's equine athlete is imperative. Core Motion is a great way to support joint health on a daily basis. Nutrition is the basis. You have to have the right nutrition to maximize your horses performance. Core Balance has very high standards in their ingredients and the levels are properly balanced. Performance horses have to have the proper nutrition to reach their full potential of their natural ability. There are a lot of nutritional products available out there and many of them are inexpensive. Proper nutrition is expensive. You need to go with a reputable company like Core Balance. With Core Balance products, you can actually see the difference in the horse. For any horse in a training barn that wants a good baseline, all-around supplement, it would be the Core Balance Training Formula. It has a good joint protectant with the rest of the proper vitamins and minerals. In performance horses, nutrition is critical. It’s very important to have the proper nutrients in the horse’s diet so when he needs them, he gets them. The Training Formula does a really good job of doing that. Core Builder is one of my favorite products. You can put a thin, not thriving horse on the Builder and see a pretty dramatic change in a month to six weeks without changing anything else. 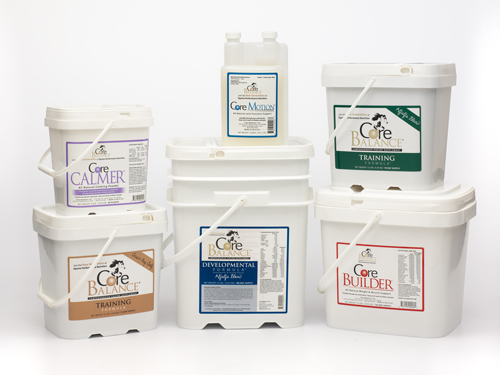 We find Core Builder to be a valuable supplement both for horses rehabilitating athletic injuries and busy, upper level performance horses. With Core Builder, you can get results in thirty to sixty days.